I am a weenie. Ok not just a weenie, the heebie-jeebies are, in fact, an everyday occurence in my life. Ghosts, ghouls, goblins, zombies? They freak me out. Bats with their beady little eyeballs? No way Jose. 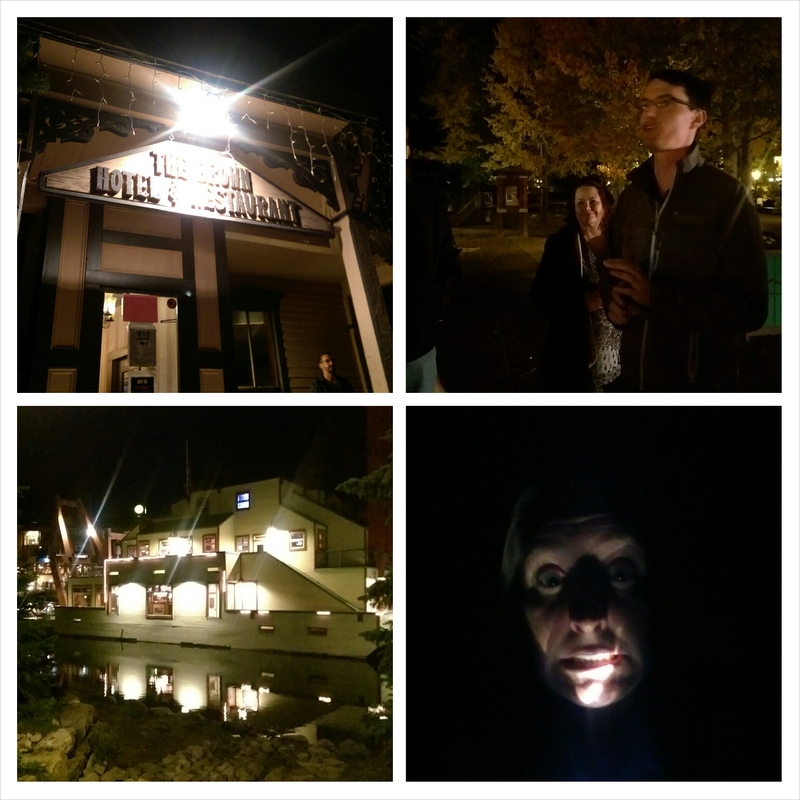 So naturally, when my friend Matt mentioned that he was hosting a walking tour of “Haunted Breckenridge” on Saturday evening with the Breckenridge Heritage Alliance, I couldn’t pass up on the opportunity. Mr. A was working so I decided to treat myself to a romantic date-night in the company of some of Breckenridge’s spookiest residents. I met Matt and the rest of my fellow tour-goers at the Breckenridge Welcome Center at promptly 7:15pm where Matt filled us in on some basic Breck history (did you know that a 13.5 LB gold nugget was found in the south branch of the Blue River in 1887?!) before heading out to explore some old haunts around town. Throughout the 90 minute tour we wound our way across town leaving calling cards at various buildings up and down Main Street, Ridge Street and Harris Street. We met such figureheads of Breck’s past as, Ms. Sylvia, a miner’s widow who lives on the second floor of the building that now houses the new to town, Apres’ Handcrafted Libations, and has the tendency of making herself known to “unattached, handsome young men”, as well as, the ever-proper example of a well-bred Victorian lady, Ms. Katie of the William Harrison Briggle House and finally the infamous (and not very friendly) Ms. Whitney, of The Historic Brown Hotel, who was shot by her lover after he discovered that she was just using him for his money. Matt did a wonderful job of keeping the creep factor down during the tour and although I was a bit fearful of entering the Briggle House in the event that I might have a face-to-face meeting with Ms. Katie, who definitely would not have approved of my not so proper attire of skinny jeans paired with fringe Minnetonka boots, I loved exploring her home and learning about the Victorian Era, complete with a glimpse of some hair art and an original Singer sewing machine. All in all, it was a fabulous Saturday “date-night” with Matt and the Breckenridge Heritage Alliance. I guess ghosts really do make for some interesting company…although the heebie-jeebies returned on Sunday when I wandered into the Black Bear Grill kitchen after everyone had left for the morning and boy, was it dark! I guess some things will never change. Mr. A went skiing up Mayflower Gulch on Saturday with some buddies and managed to leave his phone up at the old Boston Mine site where they had lunch. Lucky for him, I have a thing for men with dimples and blue eyes and he charmed me into a post-work, post-run hike up Mayflower to get his phone. Also, I cooked. Actually I GRILLED. I know, I know…impressive, right?